Gain instant access to our growing online resource where we explain everything in simple, step-by-step tasks. Gathering visa information from free resources such as forums or blog posts is incredibly risky, because the information provided is often outdated or even worse, incorrect. 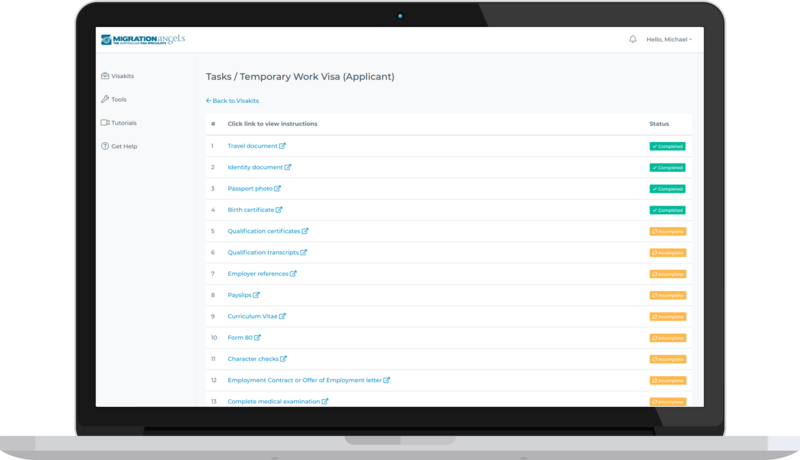 Set your mind at ease with Visakit where you have access to a complete how-to guide that’s based on Australian immigration law. Every Visakit contains tried and tested methods for getting a positive outcome. We give you an accurate representation of the visa requirements, we show you how to structure supporting evidence and provide tips on how to improve your chances of success. If you can avoid paying a migration agent or lawyer, why wouldn’t you? Visakit is all about maximising your chances of success, without the financial burden. The Visakit platform continues to evolve thanks to feedback from users around the globe. Subscribe to notifications for knowledge base, download and FAQ updates. You’re never far from help if you need it with services for every situation. Each Visakit comes with pre-configured tasks based on the type of application(s) you are making. All you have to do is follow our instructions and mark off the tasks as you go. It really couldn’t be simpler. Preparing a solid application is all about planning, data coherence and clear communication. With the Visakit tool suite you’ll prepare a laser focussed application in a fraction of the time. 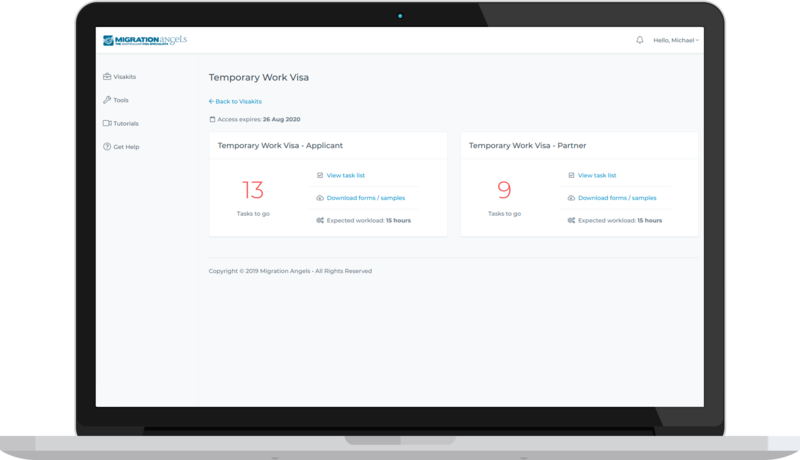 The Chronology Generator helps ensure that details provided in your supporting partner visa documentation all match up. The Relationship Evidence Indexer helps you get your relationship evidence up to scratch and ready for referencing in no time. The Personal Statement Builder creates personalised templates and helps you prepare convincing relationship evidence. Send Form 888 instructions to your witnesses in a matter of seconds. We’ll tell your witnesses what to say, and what not to say! Use the Budget Planner to create a holiday budget in a flash. You’ll need this to prove your financial security while in Australia. Not sure where to put your application documents? Don’t worry, the Application Organiser gets your application folders set up instantly. Use this tool to quickly build up your Evidence Index, making referencing evidence in your application a breeze. Hitting that annoying 4MB Immi attachment limit? No dramas, use the Photo Shrinker to compress your images. Not everyone needs a migration agent or lawyer to lodge a visa application. For applicants with straightforward cases, you might just need a little helping hand. This Visakit is for the Onshore Partner (subclass 820) visa application. It covers only stage 1 of the application. This Visakit is for the Offshore Partner (subclass 309) visa application. It covers only stage 1 of the application. This Visakit is for the Prospective Marriage (subclass 300) visa application. This Visakit is for the Partner (subclass 801 or subclass 100) visa application. It covers only stage 2 of the application. This Visakit is for Onshore Partner (subclass 820 & 801) visa applications. Applicants must meet the long-term relationship requirement. This Visakit is for Offshore Partner (subclass 309 & 100) visa applications. Applicants must meet the long-term relationship requirement. This Visakit is visitor visa (subclass 600) applications under the Sponsored Family Stream. This Visakit is visitor visa (subclass 600) applications under the Tourist Stream. This Visakit is for Trades Recognition Australia (TRA) skills assessment applications. This Visakit is for VETASSESS skills assessment applications. This Visakit is for Skilled Independent (subclass 189) visa applications. This Visakit is for Skilled Nominated (subclass 190) visa applications. This Visakit is for Skilled Regional (subclass 489) visa applications. This Visakit is for Skilled Regional (subclass 887) visa applications.